Hi everyone. 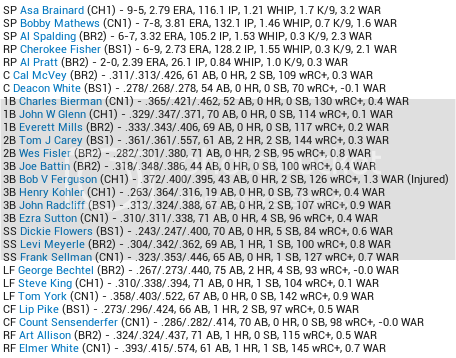 I'll be cross posting this dynasty that I started a few days ago in the OOTP forums, so just a bit of catch-up to get started. Every time a new version comes out I like to create a new league and take it for a test drive. 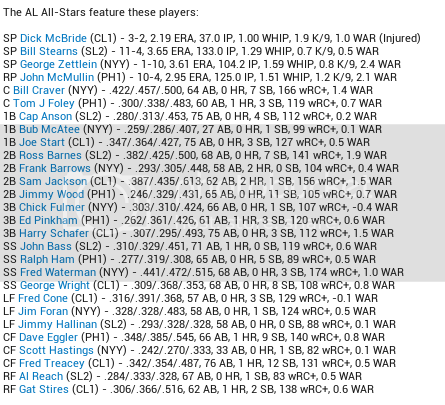 There are several new features in OOTP 16 that I'm excited for, and thought that it would be fun to start in 1871 and replay a history of Major League Baseball. I won't be taking control of any team, and will be using OOTP 'out of the box', at least primarily. That means I'll be starting with a historical league and letting OOTP control franchise movement, expansion, and player development. Historical players will import and recalc will be turned off, letting the OOTP engine control how players will develop. That will also mean that things like the All-Star game, awards, World Series, and Hall of Fame will be around from the beginning. The only changes from defaults will be turning off baseball cards, disabling spring training, and renaming a few awards - the Cy Young Award will be the Pitcher of the Year Award to start, and I change the offense and defensive awards to Silver Slugger and Gold Glove. We'll begin in 1871 with the American League made up of future franchises of the Baltimore Orioles, Oakland Athletics, Cleveland Indians, and New York Yankees. The National League will consist of the Chicago Cubs, Los Angeles Dodgers, Atlanta Braves, and Cincinnati Reds. With each team playing just 15 games at the All-Star break it's hard to get a great feel for the league, but we've reached the midpoint of the inaugural season with the Baltimore Orioles (11-4) leading the American League, and the Chicago Cubs (9-6) leading the National League. In the first half of the season Fred Waterman of the Yankees became the first player to pick up 5 hits in a game, while Fred Treacey of the Indians became the first player to hit for the cycle. The inaugural All-Star rosters were announced for the July 4th game. The American League would be victorious in the first All-Star game with a 13-4 win. Harry Schafer of the Indians was named player of the game after going 3-3 with an RBI and 2 runs scored. Thanks Chris. Glad to give it a try and share my OOTP obsession. The 1871 World Series is set with the Baltimore Orioles set to face off against the Chicago Cubs. Steve King was crowned the World Series MVP after hitting .400 for the series as the Chicago Cubs defeated the Baltimore Orioles 4 games to 2 to capture the inaugural World Series. If you like, there is an HTML enable option when you post. You can then insert the images that way. I think that's how most of us do it. Thanks, I think I'm going to give that a try, I just noticed how small the pictures were coming out. After hitting .353 for the Baltimore Orioles Ross Barnes added a pair of awards to his trophy case, winning the Most Valuable Player and Rookie of the Year Awards. It was a pair of Yankees winning the American League pitching awards, George Zettlein capturing Pitcher of the Year after going 8-17 with a 3.26 ERA and reliever Joe McDermott capturing Reliever of the Year after going 2-2 with an 11.10 ERA. Zettlein's numbers may have been a bit misleading, but Triple Crown winner Bill Stearns of the Orioles should feel robbed after going 20-5 with a 1.95 ERA while leading the league with 27 strikeouts. The National League gave Asa Brainard the MVP, Pitcher of the Year, and Rookie of the Year awards after Brainard went 17-12 with a 3.41 ERA in 245 2/3 innings for the World Champion Chicago Cubs. Al Pratt won the only award Brainard didn't qualify for by going 3-0 with a save and 1.97 ERA in 50 1/3 innings to capture Reliever of the Year.